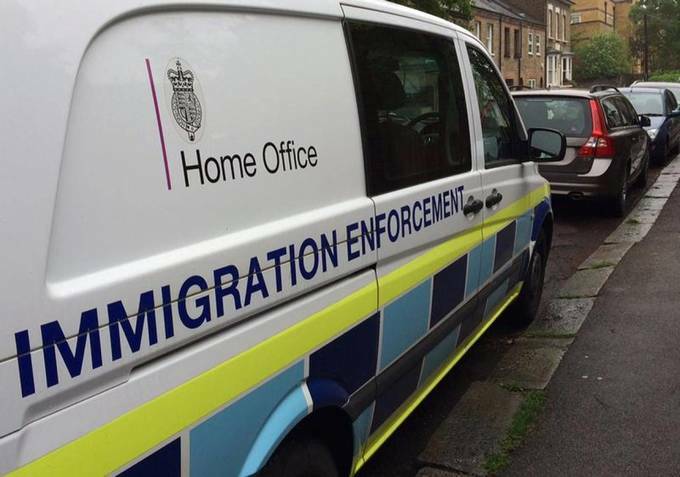 A British government Home Office van is seen parked in west London, Britain, in a file photo by Reuters. Britain has been denying refugee status to many former child slaves from nations including Vietnam since 2012. Britain is refusing asylum to more former child slaves from nations such as Vietnam, Eritrea and Afghanistan, having denied refugee status to more than 275 non-European victims since 2012 despite fears many will fall back into the hands of traffickers. Between 2015 and 2017, the government denied asylum to 183 people trafficked or enslaved as children - double the total for the previous three years - Home Office (interior ministry) data obtained exclusively by the Thomson Reuters Foundation revealed. The data - uncovered under the Freedom of Information Act - exposes for the first time the number of ex-slaves refused refugee status after turning 18. The rise in rejections may dissuade other young victims from coming forward, lawyers say. Many teenage survivors are then deported to nations where they have no relatives and end up prey once more to traffickers, according to charities that say the spike in asylum denials belies Britain's vow to lead global efforts to end slavery. "It is incredibly shocking ... that the situation is getting worse for young victims of trafficking," said Catherine Baker, policy officer at the anti-child trafficking charity ECPAT U.K.
"They are being returned to countries where they have a high risk of being retrafficked," she added. "If the government is serious about protecting child victims of human trafficking, it needs to ensure that they have long term stability and support." A Home Office spokesman said Britain was committed to supporting victims of human trafficking, including children, and that those seeking asylum would not be returned to their country of origin if found to be at risk of persecution or serious harm. "It is inaccurate to suggest that the government is ramping up the removal of people (from Britain) who have been victims of human trafficking," the spokesman said in a statement. The data did not reveal how many of the 276 non-European ex-victims refused asylum since 2012 have been allowed to remain in Britain on other grounds, but activists and lawyers say it is likely most would have been removed from the country. It is also unknown how many young trafficking victims are granted refugee status once they turn 17 and a half, when their automatic right to stay in Britain as child asylum seekers ends. "We should be ashamed as a nation," British lawmaker Sarah Champion said on Twitter, referring to the figures. In Britain, 2,118 children suspected to have been trafficked - mostly trapped in sexual exploitation, domestic servitude or forced labour - were referred to the government last year, up 66 percent on 2016 and marking the highest annual number on record. While about a third were British, many used as drug runners, hundreds were trafficked from countries such as Vietnam, Sudan, Eritrea, Afghanistan and Iraq, according to government figures. Britain is considered an international leader in the fight against slavery having passed the 2015 Modern Slavery Act to jail traffickers for life, better protect vulnerable people, and compel large businesses to address the threat of forced labour. Yet child victims of slavery have no guarantee of specialist support or time to remain under the law, which is under review amid campaigners' concerns that it has not made a serious dent in a trade estimated to cost Britain billions of pounds a year. "And if they fear being deported, they will be put off from coming forward and seeking help, and will instead disappear and go off the radar," said Tamara Barnett, projects leader at the Human Trafficking Foundation. "That is a terrifying situation." More than a quarter of all trafficked children rescued and placed in local authority care go missing at least once - with Vietnamese the most likely to disappear - according to ECPAT UK. A proposed law put forward by parliament's upper chamber this year would allow slavery victims to remain in Britain for a year and receive a support package while deciding whether to apply to remain indefinitely, or accept help to return home. Britain is home to at least 136,000 modern-day slaves, Australian human rights group Walk Free said last month - a figure about 10 times higher than a 2013 government estimate. Many child slaves are given to traffickers by parents hoping they have a better life in Britain, and end up sexually abused or forced to work in cannabis farms and nail salons - often controlled with the threat of violence or revenge on relatives. Yet those who escape or are rescued from slavery face a fresh struggle and fear when they have to apply for asylum as adults, said Ahmed Aydeed, a director at law firm Duncan Lewis. "Many of the young people we work with have lost contact with their families and have suffered torture and sexual assault," said Aydeed, whose firm has helped victims from nations including Vietnam, China and Nigeria apply for asylum. "Then they have this fear of being deported or prosecuted," Aydeed added, explaining that non-European trafficking victims are far less likely than Europeans to be granted refugee status. Many young trafficking victims refused asylum in Britain are removed from the country due to convictions for crimes they were forced to commit in captivity, such as drug offences, said criminal defence lawyer Philippa Southwell of Birds Solicitors. Child slaves discovered during police raids are often treated as criminals rather than victims, and face deportation once they have finished their prison sentences yet many have little idea about their status or fate, the solicitor said. "The system is slow and letting down many young victims of trafficking ... there is a domino effect of failings," she said. "Britain is failing to identify forced criminality."